I'm also entering this into Simon Says Stamp "Anything Goes" challenge for this week and into Verve's "April Showers Bring May Flowers" challenge. Hi! 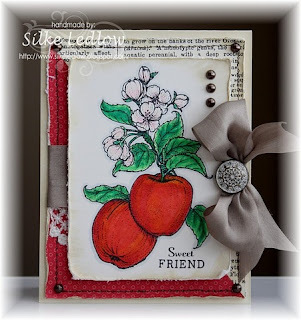 Today I'm here to share a card I made for the inspirational challenge at Lily Pad Cards. 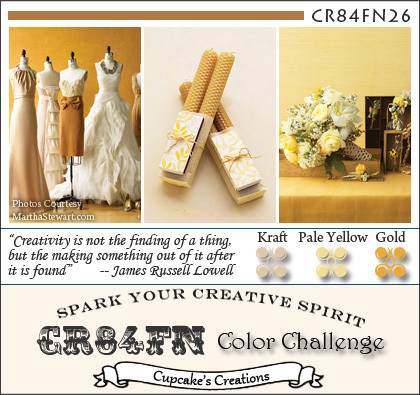 We are to choose something that we saw on the Lily Pad Cards blog and use it as our inspiration to make something new. 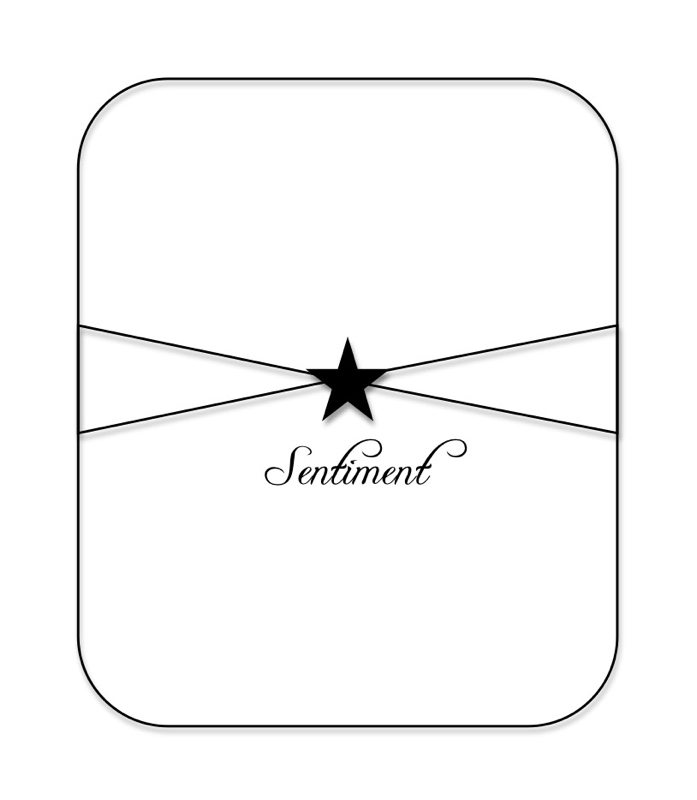 I was influenced by 2 different cards that we've seen recently on the Lily Pad blog. 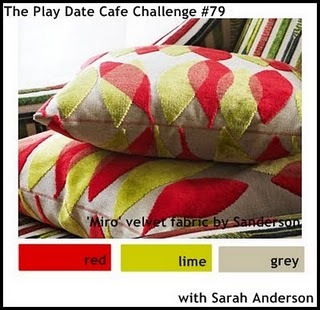 This one was entered in our first Color Throw Down Challenge, and was made by Laura Bassen. I loved the vibrant colors and how the lacy butterflies stood out against the plain white background. Here is Laura's blog, Doublestick Heaven. 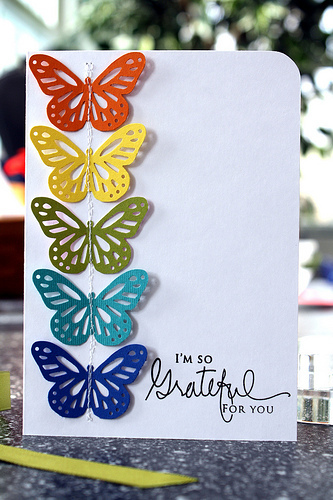 There are lots more beautiful cards there, many of them done in these clear bright colors. 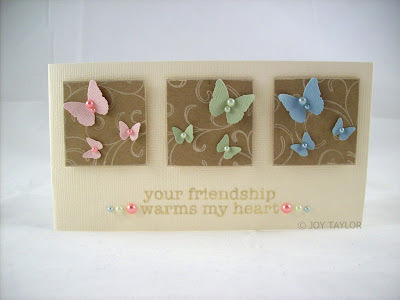 And then there was this card by Joy Taylor, featured on Deborah's Wednesday Wonder column. The pastels against the kraft and ivory just blew me away! Of course, most of Joy's cards do that to me, but this one went right to my heart. You can see more of Joy's work on her blog Less is More. 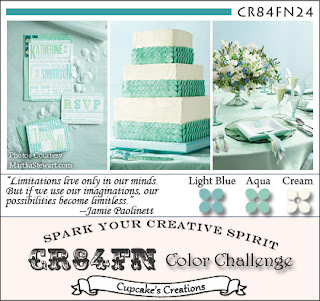 I used Laura's lacy punched butterfly idea, and Joy's pastel color scheme. And it seemed appropriate to use this sentiment, too. Most of these beautiful pastel papers came from WalMart. I hope that you'll find something this week to inspire you, and play along with us! There's a gift card from Simon Says Stamp up for grabs!! 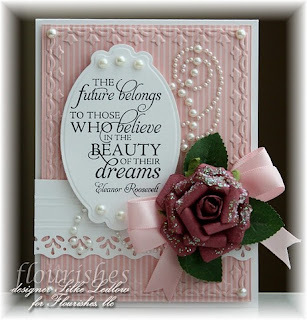 Be sure to visit Lily Pad Cards for all the details, and to see what the other team members did at their blogs: Alice, Deborah, Nancy, Sherri, Suzanne, and Vicky. I'd also like to enter this card into The Shabby Tea Room's Butterfly Wishes challenge. One of the first things my eye went to was those white lattice chairs, which reminded me of my picket fence punch, and from there I went to something having to do with a garden. (surprise, surprise) I haven't used this lovely Crafty Individuals poppy stamp in a long time, so I started with it. For fun I stamped it over an October Afternoon printed paper, then paper-pieced the flower, colored in the leaves, and added the red grosgrain ribbon. My panels are mostly CosmoCricket dps, chosen for their aqua and red color. Welcome to Lily Pad Cards' very first Digital Die Cut Challenge!! 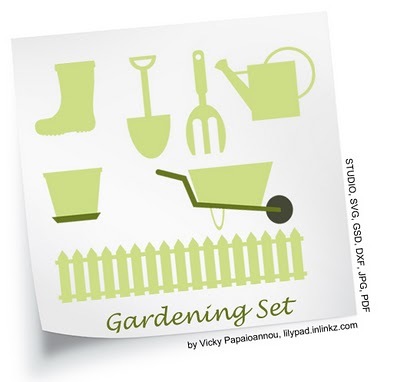 I had a fun time playing with the die-cut file that Vicky has provided us, featuring a gardening theme. Here it is, isn't it darling? Vicky has graciously offered it to everyone - just get over to Lily Pad Cards to download it for free! This card uses Vicky's picket fence die-cut file (enlarged a bit), Jen Martakis papers and fussy-cut daisies, a few stamps and punched butterflies. And my second card used everything digital, (except for the hand-cut stems and leaves), even the sentiment is part of Jen's kit The flower pots are shapes from Vicky's cut files. I just used them as patterns on the back of the papers, and cut out the simple shapes by hand, then distressed the edges with a coordinating distress ink to give them definition. I did the same with the edges of the flowers. 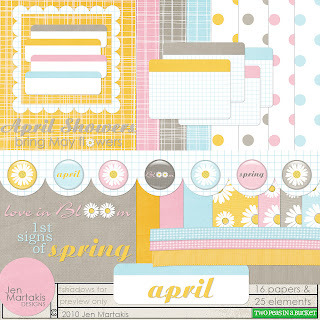 Also entering my first card into Verve Stamps "April Showers Bring May Flowers" contest. If you are here to see my card for Lucy's sketch at Lily Pad Cards, please scroll down one post - thanks! I also used a Flourish stamp, one of my favorites, from the Violets set. Violets are a sure sign of spring for me, and these colors are some of my very favorites, a periwinkle blue and a limey green. I'm also entering this into Verve's April Diva Dare: "April Showers Bring May Flowers" contest, and for the challenge at Really Reasonable Ribbon's Ramblings "Violets & Lilacs & Plums, Oh My!". Be sure to visit the other Dream Team members to see their ideas for this sketch: Alice Wertz, Deborah Nolan, Nancy Krueger, Sherri Thompson, Suzanne Czosek, and Vicky Papaioannou. And I can't wait to see what you do with it! The winner gets a prize package from Penny Black stamps! 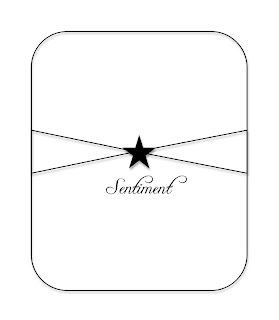 I knew I wanted to do something with lots of clean space and my eyes lit on my silhouette stamps. You know me, I had to get a little bit of pattern in there, so I chose my favorite music paper, which is a creamy tone and black. There was my palette, and I even had a sentiment that went with it. 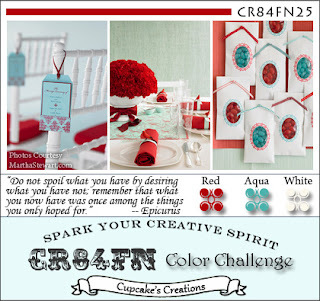 Here are the lovely colors that Mona has chosen for us this week at CR84FN. These aquamarine colors are probably some of my favorites at this time of year. The smaller print paper is from My Mind's Eye Stella & Rose "Hazel" pad, and the bigger print is a resized digital paper. When I resized it from a square to a rectangle in Word, the polka dots became polka eggs, and off I went on my bird theme! The central panel is a piece of graph paper from K&Company's Brenda Walton Flora & Fauna Ledger Pad; I chose the top of one of them that had this egg printed on it. The bird is a from Stampin' Up set called Touch of Nature, borrowed from my friend Carol. I threaded some blue and white baker's twine through the holes at the top and tied a double bow at the end. To finish I added some pearls and the sentiment. This sketch is from Julee Tilman when she was a guest designer at CASE Study last month; I just turned it 90 degrees. 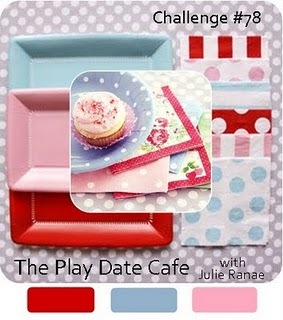 At Really Reasonable Ribbons blog, our challenge is to use any shade of purple, and a ribbon, of course! I am definitely purple-challenged, having very little of anything in my stash. Must go back to my college days when my (local) sorority's colors were lavender and grey........we had to wear it once a week, and it's taken all this time for me to like the color again! My ribbon here is a piece of white organdy ribbon which I dyed using Memories Soft Lilac ink, and then another swipe of Memories Baby Pink, to take away some of the blueness and make it more lilac-colored to match the flower and background paper. This uses a real mix of stamps and products from several companies. From Our Daily Bread comes the quote from Ecclesiastes: "To every thing there is a season....", stamped over the egg-patterned paper from K&Company. The main image, a Crafty Individuals bird image, was stamped in Hero Hues cerulean chalk ink. 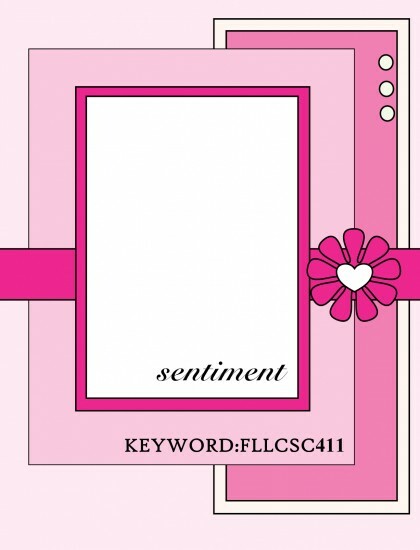 And the sentiment is a new one from Flourishes Lenten Rose set. The other printed paper is from My Mind's Eye Stella & Rose "Gertie" paper pad, and the lovely toile-like flower is from the Recollections line at Michaels. supplies: pale aqua, ivory parchment and kraft cardstocks, Magenta Crafty Individuals #95205M, Our Daily Bread "Randi's Song", Flourishes "Lenten Rose", Hero Hues cerulean chalk ink, Memories art print brown ink, K&Company Susan Winget Botanical Die Cut Mat Pad, My Mind's Eye Stella & Rose "Gertie" paper pad, Hero Arts CH231 Lace Ribbon, Recollections "Boutique Fleur"
Over at the Hero Arts flickr group, Anita organized us into a card exchange with the theme of Spring or Easter. I received my card on Friday from Sheila. Here it is in all of it's gorgeousness! Spring is bursting out all over this beauty! Love the gorgeous magnolia - don't we wish they came in this color? And the beautiful mix of printed papers shows it off perfectly! Thanks, Sheila! Love it! 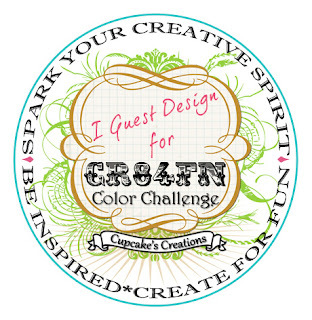 If you'd like to see more of Sheila's work, hop on over to her new blog Color Me Happy. The image was stamped, colored with pencils, fussy-cut and then glued to a digital paper which I resized to make a frame. Then I just framed out that image, adding a doily and a white ribbon to bring in more of the white color, as it is pretty predominant in our inspiration photos. The word "vintage" was mentioned in the description, and that's where my mind went. I searched my saved images for something vintage, and found this print by Jessie Wilcox Smith, one of my very favorite children's book illustrators. So that was the basis for my card. I pulled all of the colors from this image, and used Silke's sketch to put everything together.. Here is a closeup of the sweet little girl, showing her beautiful face and more of the details. I pulled the ribbon color from the flowers in her basket. If you're here to see my Globecraft Memories cards from Lily Pad Cards, please scroll down one post. Here is the sketch we are to use for the Flourishes Speed Challenge - fast paced, heart racing, get those creative juices pumping kind of challenge - they got that right!! For even more examples, see today's Lily Pad Cards post. In order to join the challenge, you don't need to have these Globecraft dome products; just use a frame or a die-cut and some pop-dots to make your creation dimensional. I just got this Penny Black collage stamp and thought it would be perfect for this challenge. It was embossed in black and then I just colored in the poppies in a pale pink marker. Added some dps, lace, pearls, ribbon, a punched butterfly, and the sentiment. 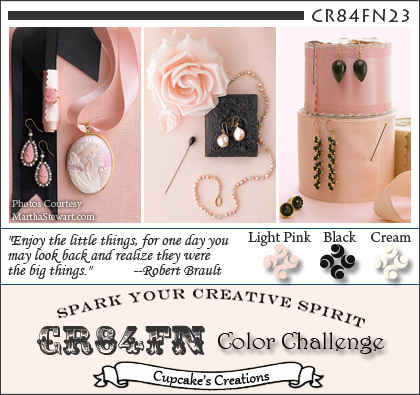 I'll also be entering this into Penny Black's flowers challenge. 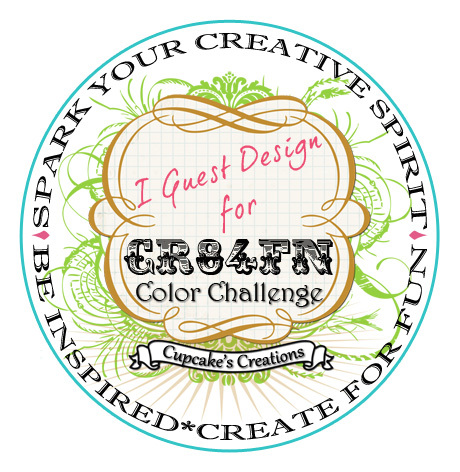 Here's the inspiration picture for the challenge - beautiful colors, don't you think? Here's another picture with my nest that I cherish, filled with old robin's eggs or pieces of them. Every spring I scout around the big blue spruces in back and often find discarded eggs. The nest is, we think, a hummingbird one that my Dad found one year, made of horsehair (he lives adjacent to a barn housing horses). 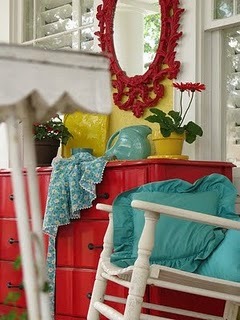 Do you not LOVE this inspiration photo for this week's Moxie Fab World Tuesday Trigger? Cath entitled it "Porch Play". I adore this little scene. I would never have the courage to put these colors together in my home, but that didn't stop me from reconstructing it on a card! As soon as I saw that gorgeous red mirror in the inspiration photo, I remembered this frilly oval frame that I was recently given by a special friend. Then I just pulled the colors and some of the elements out of the inspiration: gerbera daisy, flower pot, turquoise fabrics, zig-zag trim. I also scored the background of the card to resemble a panelled wall.